Now you can improve your margarita station with this Professional Bar Quality Glass Rimmer/Margarita Salter! Our rimmer features 3 separate compartments specially designed to hold salt, sugar, or citrus juice. The citrus juice container holds a durable sponge to absorb your lime or lemon juice. Our handy and convenient tool keeps all the necessary ingredients for perfecting your margarita in one easy to access location. To use, simply dip the rim of your glass into the sponge and immediately dip into either salt or sugar, depending on taste. The result will be a beautifully rimmed glass with an appealing presentation! All three compartments are interconnected by 3 rotating trays, and can be accessed in one continuous motion. The black color design will complement any home or bar decor, and its rugged plastic construction is durable and easy to clean - wash by hand or throw it in the dishwasher! For easy cleanup, this unit collapses quickly and neatly - keeping contents contained in spill-free storage. Each compartment can accommodate glasses with rim diameters up to 5.25". Our Salt Rimmer is perfect for your home, bar, restaurant, hotel, resort or other establishment serving margaritas and mixed drinks. Its cool, sleek design will add an extra flare to your bar setup and social scene! And the best part is the 3 tiers close in for compact storage and portability. Click 'Add to Cart' now to pick up a set today! 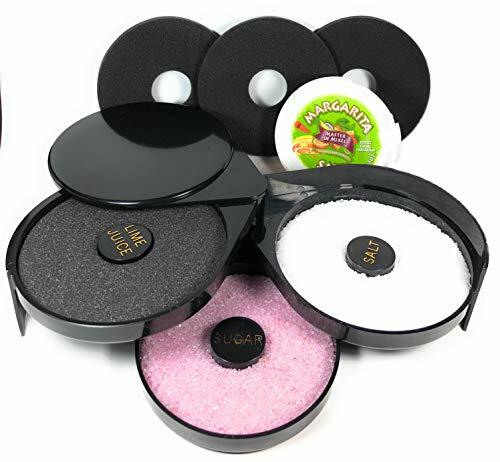 ✅ BUNDLED SET - our set comes with a 3-Tier Plastic Glass Rimmer (including 3 labeled rotating trays designated to salt, sugar, and lime juice), one 8-ounce container of Margarita Salt, & 3 replacement sponges...instead of having to piece items together, you set comes with everything you need in one convenient bundle! ✅ PROFESSIONAL BAR QUALITY - our rimmer is made from food safe druable ABS plastic and is ideal for home or professional bars, hotels, restaurants, resorts, etc. Also, be ready to swap out your old sponge for a brand new one with one of our 3 replacement sponges - these are in addition to the sponge that comes with the rimmer. ✅ PERFECT FOR MARGARITAS AND OTHER COCKTAILS - our salt & sugar glass rimmer provides an all-in-one convenient tool for your cocktails, and is perfect for Margaritas, Bloody Marys, Frozen Drinks, and Gimlets. ✅ DURABLE & DISHWASHER SAFE - made from commercial grade ABS plastic, our salt rimmer is flexible, lightweight, and durable. When finished using, close for compact storage. Hand wash or put it in the dishwasher worry-free. ✅ CUSTOMER SATISFACTION GUARANTEE - We're confident you'll love our 3-Tier Salt Rimmer Bundle. However, if you're not completely satisfied, we'll give you a 100% refund within 30 days of purchase, no questions asked. We pride ourselves on providing our customers with the best customer service on Amazon, and you are always our top priority. Add a 3-Tier Glass Rimmer Bundle Set to your cart today. If you have any questions about this product by SUMMIT Salt Rimmer Bundle, contact us by completing and submitting the form below. If you are looking for a specif part number, please include it with your message.